It is a New Year, and that also means there are new opportunities to make significant progress toward your goals! 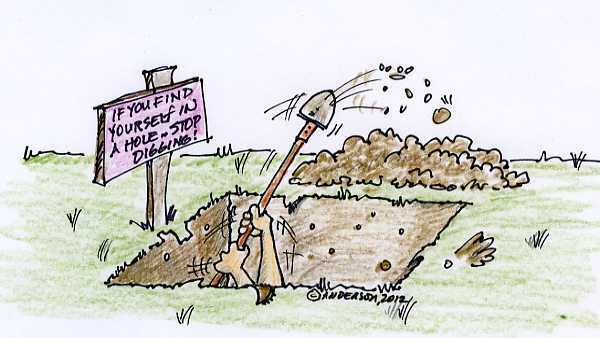 But take this to heart: famous investment guru and billionaire Warren Buffett once said that if you find yourself in a hole, the first thing you must do is “stop digging”. While this sounds basic, people every day are digging themselves deeper and deeper into debt. They are spending more money each month than they bring home from their paychecks. If you are serious about changing your financial future and getting on the right track to enjoy more freedom with your money, then you must stop negative spending habits! You must commit to end this bad habit now. Debt and over-spending has an incredibly negative impact on your financial future as well as your relationships and marriage. Do you have a PLAN? If you have consumer debt now, what is your PLAN to pay it off? Do you have a PLAN? Do you know WHEN your debt will be completely paid off at your current rate of repayment? How about your cash flow? Do you know to the dollar how much money you bring home each month? Do you know exactly how much is going out? You and your spouse are always bickering over money and you constantly feel the stress of living paycheck to paycheck. You live within your means; have money in savings, and you and your spouse’s money arguments have ceased. Here are some critical first steps to help you STOP DIGGING and START PLANNING. Set goals…and discuss them. Set aside one evening (this week!) with your spouse and write down your money goals for 2014. What results would you like to see by the end of this year? Be specific. What will no longer be acceptable to you both when it comes to bad habits with your money? Create your “unacceptable” list for your 2014 finances. I hope this helps! If there is anything we at Aspire can do personally to help ensure 2014 is your best year ever, please let us know. We can connect you with top financial professionals we know and trust. We can also provide a quick complimentary review of your mortgage and/or other debts if you would like. Whatever it is, Aspire Mortgage Group is here to help you achieve a better financial future! This entry was posted in Blind Spot 1: Developing a Plan, Blind Spot 2: Increasing Fiscal Literacy and tagged blind spots, debt management, developing a plan, financial advisor, financial future, financial planning, goals and dreams, home loan, home loans, loans, money, mortgage, mortgage lenders, pay off debt, Portland Real Estate, Refinancing, saving money, wealth. Bookmark the permalink.